I started cooking for our hunters in 2012, before this we had hired a cook because I was teaching school. Cooking for eight to ten people can make a person a little nervous. I am definitely a perfectionist when it comes to cooking. I want everything just right. I know it’s silly. My husband is always telling me that the guys won’t care because they are just happy to eat after sitting in a blind all day. Phew! Everyone enjoys a good meal and not just a mediocre one. Let me just say I had to cook this meal of lasagna and cheesecake for some guys from New Jersey. I was really nervous about the cheesecake because they can get amazing cheesecakes there. But then one of the guys came through the kitchen and said his wife was from Italy. OH NO!! Would this be up to par. It was! I received rave reviews and have every time I have made this. This cooking OCD I have, inspired me to find the best lasagna I could. I can not tell you the number of recipes I looked at, read reviews on, printed out, and searched for. Let me just say there are hundreds, no thousands of recipes for lasagna. I think everyone has their own recipe that they have been handed down, found, claimed, revamped, whatever. I however did not have one. I am more of a fried chicken type girl. Italian food is a little out of my genre. Well as I was looking it became pretty clear that for good lasagna you have to have a good sauce. Am I right? And good sauce is homemade. Am I right again? So therefore I decided upon a recipe that looked pretty easy and I was going to give it a try. It turned out pretty darn good. Then with some revamping of my own. It has become my staple. This recipe gives the most amazing sauce I have ever eaten. Yes, we eat it out of the pot as it is cooking. If you walk by the kitchen when this is simmering. You will not be able to keep your self from getting a spoon, and trying a little sample. I will say it is a little bit of work, but the benefits are so worth it. I have also found that you MUST use diced tomatoes. I pour a little into my hand over the pot and smash around. Then pour another handful and repeat until it is all smashed. I tried whole tomatoes and crushed tomatoes. They just don’t work. For some reason, it just makes the correct mixture to crush by hand. This makes a ton of sauce. I mean you will need a large pot for this. 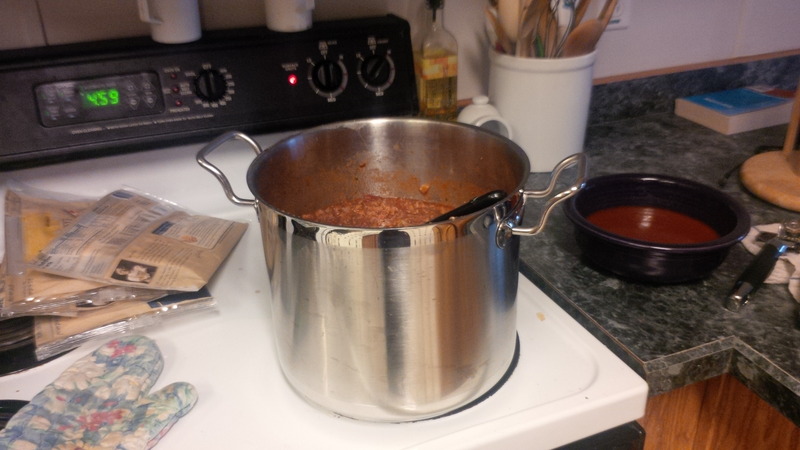 I usually double it, so that I can make two lasagna pans. One for that meal, and another to freeze. I am really into freezing for future meals. Makes life so easy sometimes. You can also freeze the sauce to use in spaghetti and other pastas. In a large saucepan cook sausage, ground beef, onion, and garlic over medium heat until well browned. Stir in crushed tomatoes, tomato paste, tomato sauce, and water. Season with sugar, basic, fennel seeds, italian seasoning, 1 tablespoon salt, pepper, and 2 tablespoons parsley. Simmer, covered for about 1 1/2 hours, stirring occasionally. Bring a large pot of lightly salted water to a boil. Cook lasagna noodles in boiling water for 8-10 minutes. Drain noodles, and rinse with cold water. In a mixing bowl combine ricotta cheese with egg, remaining parsley and 1/2 tsp salt. To assemble, spread 1 1/2 cups sauce in the bottom of a 9×13 inch baking dish. Arrange 6 noodles lengthwise over meat sauce. spread with one half of the ricotta cheese mixture. Tope with a third of mozzarella cheese slices. 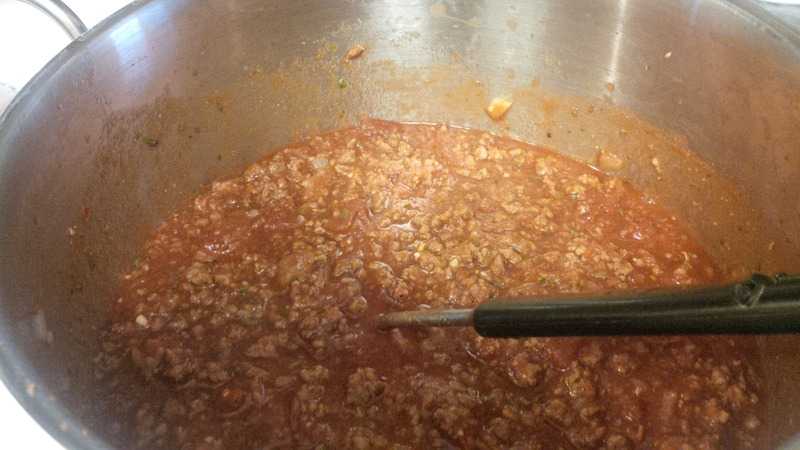 spoon 1 1/2 cups meat sauce over mozzarella, and sprinkle with 1/4 cup Parmesan cheese. Repeat layers. Top with remaining mozzarella and parmesan cheese. Cover with foil to prevent sticking, either spray foil with cooking spray, or make are the foil does not touch the cheese. Bake in preheated oven for 25 minutes. Remove foil and bake an additional 25 minutes. Cool for 15 minutes before serving.